In 1986 Joan Jefferson came to the Downtown Business and Professional Association and asked us to form a Main Street Program for numerous reasons including the fact that the Downtown would receive a better review for the Community Development Block Grant that would fund the replacement of antiquated infrastructure. The Downtown Business and Professional Association agreed and proceeded with the application to Main Street. Jim Dirks of Stuart Stained Glass and Jim Blough of Blough’s Antiques drove to Tallahassee to answer questions on our behalf. We were designated a National Main Street community by the State of Florida, Bureau of Historic Preservation, in March 1987. We raised the funds to pay a manager, and I was elected to lead the start-up. The easiest duty was to interview and select Donna Renninger, as our first Main Street Manager. The hardest function was to acquire free office space for Donna because funding for everything came from donations. During those first years the Main Street office moved several times, as donated office space was leased out to others by the landlords. My objective was to create a diversified Stuart Main Street Advisory Board composed of professionals and organizational leaders representing as many areas as needed in order to hit the ground running. Those volunteer individuals are listed on the first Stuart Main Street brochure that was contributed by the Chamber of Commerce and Fast Graphics. The Florida Main Street Program provided us with three years of technical support and $10,000 for awarding grants to property and business owners for the purpose of making quick improvements. Five $2,000 grants were awarded for façade improvements that generated enthusiasm about Downtown’s revitalization. In the second year Ann MacMillan volunteered to Chair the Promotion Committee and the first Dancin’ In The Street took place. Income from this event funded the Main Street Manager’s salary. The now-retired Judge Shields McManus was the Stuart Main Street Chairman for year two, followed by Bonny Turner of Florida National Bank (now Seacoast Bank, I believe) for the third year. 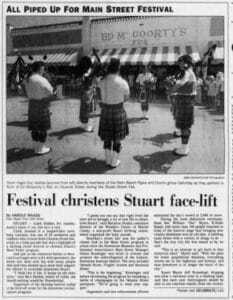 It was many years later that the City of Stuart contributed some funding for the Manager’s salary. However, the City did step up and provide office space, after the passage of the first few years. Stuart Main Street’s focus was on Organization and Promotion in those early years. However, we understood the significance of Historic Preservation, as noted in the first brochure as “Unique Historic Architecture.” At that time the Lyric Theater was a church, and Roy Laycock began the effort to purchase the Lyric via donations because the church was moving elsewhere. Roy understood the significance of the Lyric for its history within our community. Thirty years have gone by. The vision for Downtown Stuart that was created through Andres Duany’s charharrettes has been achieved . . . for the most part. Downtown is alive and thriving.